Description: I was walking back from Sonic and got REALLY lucky and found this loaded northbound grain train coming, after a short wait, I got to take this series of photos. Description: NS 20G coming out of Allentown Yard with an ex-CR SD40-2 and a UP SD70M trailing @ CP Bethlehem. Description: Union Pacific SD70M 4660 was the second unit on train 21M. Description: A southbound manifest with cool power meets an autorack repo move slow rolling up the siding at Bernie. Description: UP 4660 leads the Rocket Train over Rich Mountain on KCS's Shreveport Sub. Description: UP 4660 waits between assignments at UPs Global 3 Yard in Rochelle, IL. 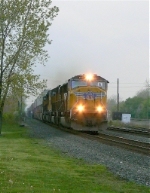 Title: UP 8730 Runs a EB stack train at Tk speed. 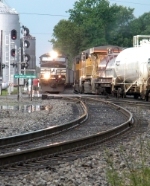 Description: Heading though the small town of Sugar creek Mo on the Transcon. Description: Live Oak Canyon Road. MP 549.46 UP Yuma Sub.